Posted on December 3, 2018 at 12:33 pm. 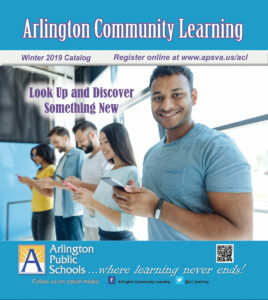 Registration for the Arlington Community Learning Program is now open for the upcoming 2019 winter semester. Most Arlington residents will receive a course catalog in the mail this week. There is a wide variety of classes to choose from, including computer, foreign languages, music, art, financial planning and cooking classes. In addition to these topics there are many other classes and workshops available.